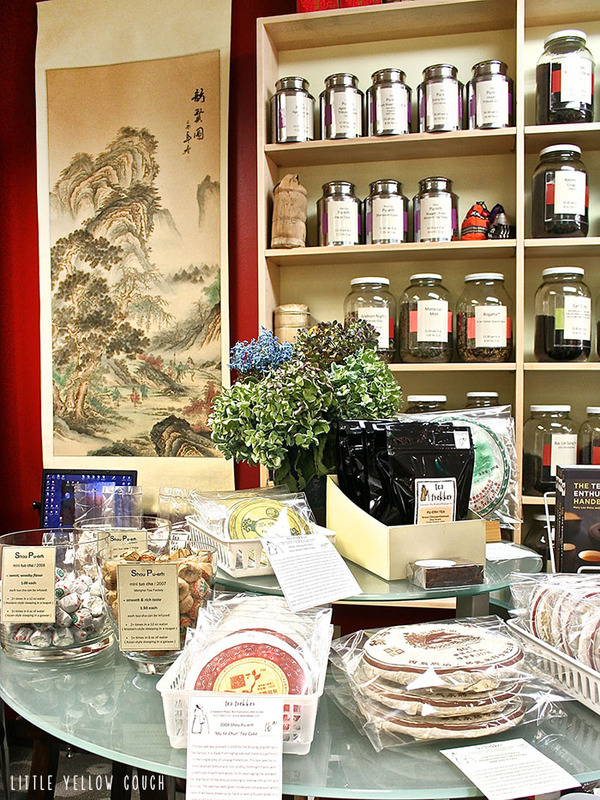 Mary Lou and Robert Heiss were dubbed “the Professors of Tea” by the New York Times for their extensive knowledge on the subject. They have travelled throughout China, Japan, Taiwan and India and brought their knowledge of tea culture back to the States. Bob and Mary Lou have written several books on the subject of the history and practice of growing and incorporating tea into daily life, including a beautiful tome, “The Story of Tea", and the extremely helpful guide, “The Tea Enthusiast’s Handbook". Little Yellow Couch: How did you first get so excited about tea? Bob Heiss: Mary Lou and I opened a tea, coffee and spice house back in the seventies, with coffee being the major player. China was still closed to trading so there was a limited number of options for tea and our ability to offer a large variety of it was definitely hampered by this. By the late 90s, China had opened up and all of a sudden, there were all of these amazing teas we could get our hands on. Ultimately, this is what lead to our first trip to China in 2000 to start meeting tea growers. And we’ve been dedicated to tea ever since. LYC: What was it like going to China that first time? BH: That first trip was really eye opening. We were among the first people in the tea business to make this kind of trip. We soon came to understand that when we’d learn something about how to make a particular tea, it didn’t translate across other regions. You really had to go to each region individually to learn how each place uses their tea leaves to make their particular beverage. LYC: And this lead to your passion for delving into the complexities of tea? BH: Absolutely. And the complexity with which tea is made is what makes tea so different from coffee. Now, I love coffee, but it just doesn’t have all of the different elements that go into how it’s made that translate into a multitude of different end results. With coffee, you have maybe 3 or 4 decisions you need to make regarding how you’re going to cure it, roast it, etc. Tea is more like wine in terms of the level of complication that goes into each type of tea. In fact, tea trumps all of these beverages in terms of the number of factors that go into it. You’ve got all of these different types: green, black, yellow, white, oolong...and then you also have the different terroir, the level of oxidation, all of the different sub-varieties of the bushes themselves… the possibilities are really countless. LYC: And then you became really adept at sharing all of this knowledge with people back here! BH: Well, all of this did lead to our first book, The Story of Tea, which was published in 2007. We actually put off the original publication date and took an extra trip back to China to make sure we got all of the details right. We wanted this to be a relevant and accurate book for years to come. Mary Lou: Yunnan, which is gives it that honey, caramel flavor, and Keemun, mostly. LYC (to Bob): So can you blindly taste things and guess what it is, where it comes from? BH: We can certainly get pretty close! But if someone is trying to trick us…say, after a whole day of drinking oolong, that’s when it gets tricky. It’s called being drunk on tea. Our Asian friends say it’s your chi rising, but you basically feel goofy in a pleasant way. LYC: What about caffeine? We were surprised that we didn’t feel shaky after drinking your green and black teas that we served at our party. BH: People get worried about caffeine. But when it’s all part of your diet, your daily ritual, you’re actually drinking less of it all at once. You’re drinking small amounts throughout the day and you really don’t feel the effects of caffeine. As for the whole “healthy” benefits of tea that’s been a big deal lately, we wish it had never been labeled like this. You’d have to drink a lot of it, and the kinds that are fresh, not something that’s been boxed and bagged and sitting on a grocery store shelf for months, to get any benefit. And then people get disappointed because it doesn’t seem to be providing the miracle cure-all they were expecting. We think it’s better to just steep whatever tea you really like the taste of. LYC: Speaking of steeping, how complicated is it to become good at making tea? BH: My attitude about tea is that you can make it as simple or as complicated as you want to. I like to tell people that if you can boil water, you can make tea. That’s the simplicity of it. But if you want to make it complex, you can do that, too. Some people drink tea not just for the taste but because they want the ritual. They want that ½ hour time that’s set aside…that tea time. And then, there’s nothing better than what you did, which is to have people over and make it an event. To take the time to really treat your friends to something special. So, the two critical things to get a handle on when preparing tea are the temperature and the time in the water. To measure the time, bring water to a boil. Once you take it off the stove, the temperature will drop 10 degrees for every minute it is cooling. The amount of time the leaves should stay in the water depends on the kind of tea you’re making. LYC: And what would be a good “starter collection” to keep in stock for yourself and when guests come over? BH: If someone comes into the shop and is new to tea, I always start them off with something simple to taste, to steep, so that they fall in love with it and don’t get discouraged. It doesn’t have to be expensive or overly involved to be good. A good variety to have on hand is, maybe three different teas. Either a green, a black and a tisane (what Westerners call herbal tea), like you did at your tea party, or maybe one type but from three different regions so you can compare and contrast. For instance you could have all black teas, a Northern Indian, a Chinese and a South African. If you’re looking for tea for a specific event or to serve to a particular guest, I might ask if there’s anything culturally in their background to give the choice some context and then I’ll also ask what you’re serving alongside it. LYC: And what about storing it? BH: In the cultures where tea comes from, whether it’s drunk all day long or during a longer, daily ritual, is always kept, with all it’s accoutrement, in one special, specific place. If you go back to history, it was always kept in a tea chest. It was locked because tea was valuable and the person who held the key was given a great responsibility. In terms of controlling temperature or whatever, in the countries that tea is from, they’re not doing anything heroic with it. They don’t use refrigeration. With very few exceptions. The Japanese love to keep their green tea refrigerated. And oolong. Sometimes. But mostly, tea would just prefer to be where it’s warm. Because that where tea feels it’s at home. We keep our teas stored in containers that are completely sealed. If anything, I would say that that’s the most important thing. We can't thank Bob Heiss enough for both sharing his knowledge with us and his passion for tea. When you meet someone who has a true passion for something, it is incredibly contagious. We are so delighted to have our own growing love for tea and especially excited to share this with all of you. We highly recommend ordering yourself one of Tea Trekker's teas and treating yourself to this timeless ritual. Editor's Note: On Bob and Mary Lou’s website there are some wonderful tutorials on how to choose and make tea. We love that they want you to figure out of you’re a “supervisor” or a “wanderer" when it comes to making tea. The former is someone who enjoys strictly following time and temperature rules to coax all of the nuance out of the leaves. The latter is someone who would prefer a small margin of error when they’re making tea, and therefore would like to buy teas that don’t mind that fluctuation.